People who focus on ideas prefer non-contradiction, but preference is preference. They elide conflict, they don't resolve it. Frank Pasquale at Balkinization links to Danielle Citron at Concurring Opinions. The title of her post: "Only in Texas: the Grave Error of Using Literature Rather than Scientific Methodology to Assess Mental Retardation in a Capital Sentence Case"
My comments on her post, with a link to Jason Stanley. The Mad Scientist is the central mythical demon of the 20th century. 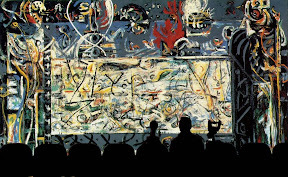 Speech claiming to be science has justified more destruction than speech claiming only to be art. An amusing parallel. For me the timing was perfect. Perhaps philosophy has fallen into disfavor among humanists because philosophy has not been true to its roots. According to one sort of myth of this sort, traditional philosophers were commentators on culture. In the 1920s, philosophy was then ruined by the Logical Positivists, who created a new, dry, vision of philosophy. In their quest to declare the traditional questions of metaphysics meaningless, they divorced philosophy from the broader connections with culture and politics that give it life. The Positivists lost favor on the continent, and obtained posts in the barren intellectual wastelands of Chicago and New Haven, bringing their dry, logical methodology with them from Vienna. This story is false in every detail. Logical Positivists prized the deliverances of mathematics and science (as did Aristotle, Descartes, Leibniz, and Kant). But nothing follows about a lack of political and cultural presence. Core members of the Vienna Circle, such as Carnap, Feigl, and Neurath, all lectured at the Dessau Bauhaus. As Peter Galison has emphasized (“Aufbau/Bauhaus: Logical Positivism and Architectural Modernism,” Critical Inquiry, Vol. 16, No. 4), what united the Logical Positivists and the members of Bauhaus was a desire to create an alternative vision of social relations than the one promulgated by Volkisch thought – the intellectual representative of National Socialism. The universalism of modern architecture was an illusion and its plans ended in failure. I’m not defending an obscene decision any more than I would defend eugenics, but please, stop pretending like the author of the quote above, that philosophy and law do not concern values more than science. For you and the idiot who posted at Balkinization, a piece on the humanities in society, here. I've quoted the last link before. Holmes was a notably well-read man, but we have little doubt that he would have scoffed at any idea that reading literature or engaging in the humanities would have the edificatory effect that Learned Hand seemed to advocate. He probably would have insisted that acquaintance with Homer and Shakespeare would not have changed what ambitious young lawyers in the Office of Legal Counsel wrote to please those in power. Even a torturer can love a sonnet. . . . There are probably more than a few cultured persons among the Texas officials blocking the Medicaid expansion, or overheating its prisoners. The best that can be said for them is that they, like de Maistre's executioner, are integral to "bond[s] of human association" that rely on collective enthusiasms to impose harm on others. I haven't read the Balkin and Levinson article. I will in the next day or so; it should be better than the piece by Jason Stanley. Reading all of them over the years it's clear Balkin and Levinson have something in common with Stanley's father. It's still a question how much they realize it. 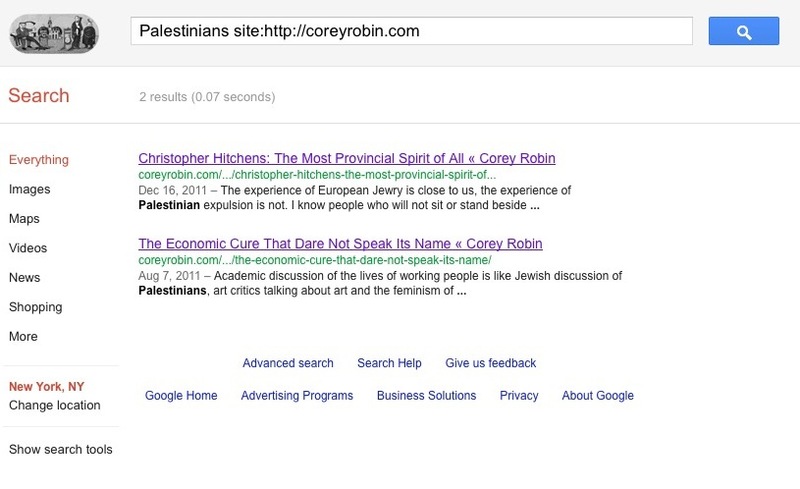 The reference to de Maistre links to Corey Robin who quotes him. I adapt the quote, changing two words, in a comment on Robin's post. "And yet all grandeur, all power, all subordination rests on the law: it is the horror and the bond of human association. Remove this incomprehensible agent from the world, and at that very moment order gives way to chaos, thrones topple, and society disappears." All too true. The terror of the law is that it is impersonal. If it were to become subjective it would fall apart. Is the law objective? No. But I'm not here to explain to you the aporias of life, just that they exist. "The ACLU is a conservative organization." Spencer Coxe was director the the Philadelphia ACLU from 1952 to 1979. The ACLU defended the Nazis in Skokie out of a conservative's sense of pessimism. Liberals are optimists; the rule of law is conservative. 6 months ago your page looked like this. The search brought up my comments and nothing else. I see now you wrote something, about anti-semitism. That's progress I guess, but it doesn't make me an optimist, or a liberal. And now we all can sleep at night. People now like to mistake ideas for values, or they think somehow values are merely the result. So what are the values that say that it’s fine to kill someone who tests two points above whatever line of measurement? Pasquale links to Corey Robin. Is your scientist any more human that de Maistre’s executioner? Is he any more passive before whatever authority gives him permission to kill? Constitutional debate is debate over a the interpretation of a common text. It’s not that much different than a debate over the meaning of the Bible or any other work of fiction. That’s not science. The debate is how we come to an agreement over what we value as a group. Agreement is not truth. ...Ask people what they value and most start babbling incoherently. Ph.D.'s do about as bad a job as anyone. I understand why a conservative layman would come to the decision as the judges have. I don’t agree with it as I also do not agree with the death penalty. The bureaucratic language of the documents -cold, without affect- was depressing. If the author found him one notch higher he would have used the same language to sign off on his death. 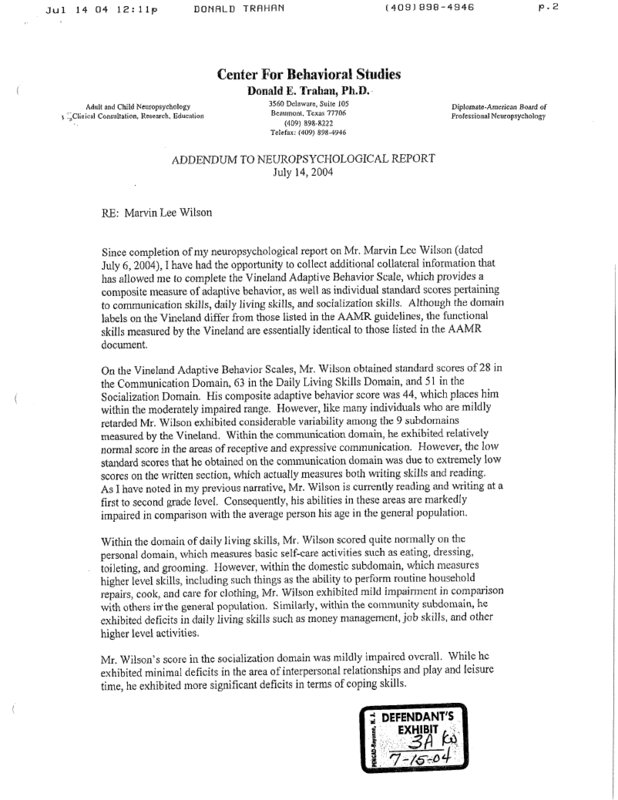 The diagnosis and addendum [the second also below], and Marvin Wilson's letter asking for pen pals. "I am Marvin Lee Wilson, I was born Jan. 5,1958 and just turned 46 years of age. I stand 5’11” tall and I weigh 198 pounds. I am of a creamy brown complexion with mitching[sic] brown eyes and I usually wear a nice smile whether I’m jolly or sad. I enjoy reading, working out, trying to learn how to draw, playing chess and I love writing letters but they are not able to exchange as many letters as I need to keep me comfortably occupied, so I’m pretty lonely these days. I’ve been on death row ten years come May 4, 04, and I’ve been incarcerated 11 years and 2 months in all. I am from Beaumont, Texas, I am the second child of six, three boys and three girls and I thought someday I’d be a pro football player but I ended up dropping out of high school in my 11th year to work construction in order to help my sickly mother take care of the household, yes, daddy ran out on us for the outside woman and hers. I then got involved in my very first relationship and it produced a son into my life. The weather was hindering my working and I begun to desperately look for an inside job or a job the rain couldn’t hinder so I could take care of my child and so I could get situated to marry his mother and become a good husband and father unlike my daddy. But it seemed most impossible for me to land a job in which I humbly looked for one whole year before I decided I have to do something and started working the streets..."